Adam Fitch’s rapid transit map. His LRT line would run from a proposed new Emily Carr SkyTrain station in east False Creek to UBC. The red line on the map, with marked stations, traces TransLink’s SkyTrain route plan as of about 2012. In the real world, stations from Arbutus are to go into service before 2025; stations west of Arbutus have been delayed indefinitely. Adam posted a video on YouTube in October 2018 to advance his proposal. My thanks to Kamloops-based planner Adam Fitch. He invited me to join him on a May 4 “Jane’s Walk” to consider a cheaper alternative to the Broadway Extension rapid transit project. 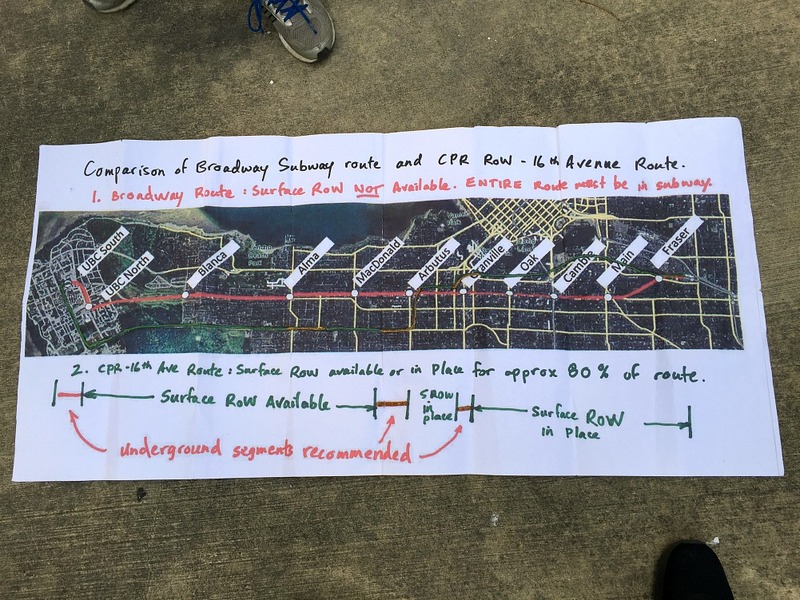 Fitch’s proposal would take advantage of a corridor owned by the City of Vancouver, and would avoid most of the tunneling costs associated with the Broadway scheme. It’s an entertaining concept, but it won’t get built, largely because it won’t take people where they want to go. TransLink’s Broadway Extension, previously referred to on this site as the Arbutus Line, is an approved project that will extend the Millennium SkyTrain line from Clark Drive to Arbutus Street in Vancouver. Scheduled to begin construction in something like 2021, most of it would be underground. Federal and provincial governments have promised to fund the Broadway Extension, but costs are rising. TransLink announced on April 30 that rising property values, among other issues, have driven the estimated cost to $2.83 billion, up from the $2.28 billion estimate provided in 2015. Photo from the Public Transit in Ottawa blog. 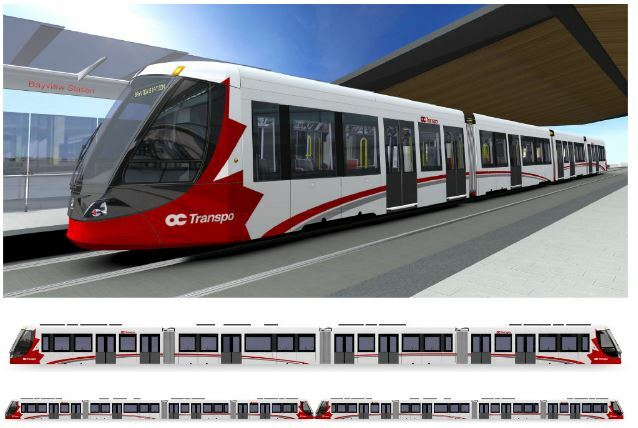 Adam Fitch proposes a less expensive above-ground light rail system (with short tunnel segments) to reach the University of British Columbia, using trains similar to those that are now in service in Ottawa. He says his cheaper option hasn’t been seriously considered for Vancouver because it wouldn’t deliver the same high-rise development profits as SkyTrain (see Metrotown, Brentwood, Surrey Central, etc. ), and because SkyTrain has a big-city glamour that voters like. The Fitch light rail route would run west along the abandoned False Creek streetcar right-of-way, owned by the City of Vancouver, and then west and south along the former Canadian Pacific rail corridor, purchased by the City in 2016 after years of litigation. It would turn west on 16th Avenue and proceed to UBC. Fitch says the construction could be completed for one-quarter of the cost and in one-quarter of the time of the Broadway Extension. He says the total travel time for his trains to run from False Creek to Arbutus would be just two minutes longer than the comparable ride on SkyTrain. The surface trains stop more often, but SkyTrain passengers would need to ride an escalator up from the depths to reach their station, while LRT passengers are already at grade. Jane’s Walkers on the Arbutus transit corridor just west of Fir. 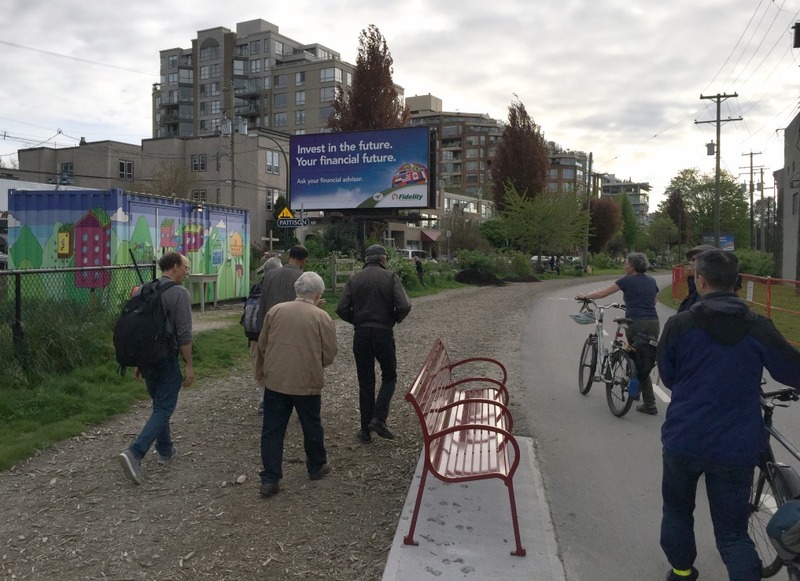 Tax consultant Robert Smarz and I joined Fitch and six other tourists to walk the section of Fitch’s line from Granville Island to Broadway and Arbutus. We noticed that like a lot of big thinkers, Fitch falls short in the organizational department. In five years of campaigning he hasn’t managed any online posts to promote his proposal. The rolled-up cloth map shown at the top of this page was the only illustration available for Voony’s Blog when that site commented on the Fitch proposal in 2013, and it is the only easily accessible resource today. 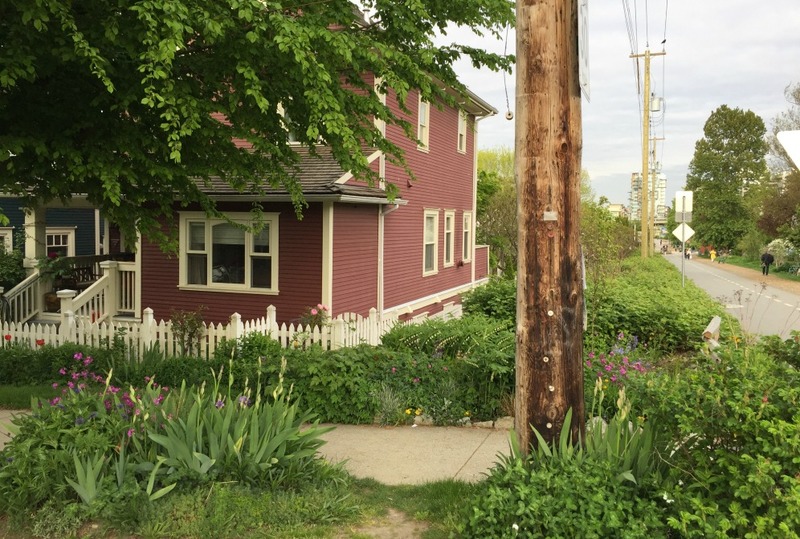 Fitch led a series of Jane’s walks in 2014 to boost his idea, and blogger Steven Rees invited readers to comment. “Rico” seized on the same point as Voony had a year earlier. “MB”, whose comments on the Broadway Extension were featured on this site in 2015, scoffed at the Fitch proposal because it wouldn’t serve riders and because it ignores cost issues related to utility relocation. “But oh yes, this tram line would still be a “bargain” compared to a subway on Broadway. Well, that’s not a comment that can be applied to Adam Fitch’s route because it avoids the transit demand of Broadway altogether, which just happens to exceed the demand for UBC. The Arbutus corridor, now owned by the City of Vancouver, at Broadway. This section of pathway is heavily used by pedestrians. In the Adam Fitch concept it would sit above a kilometre-long streetcar tunnel. I like the Fitch proposal, in a sentimental way. I would like to think that at-grade transit is better than SkyTrain when it comes to supporting neighbourhoods, although the evidence is mixed. (Calgary has a 40-year old LRT system, with limited land use benefits; Metro Vancouver has enjoyed a few SkyTrain oriented successes, notably Joyce-Collingwood and Coquitlam Central-Lafarge Lake.) The Fitch line would offer a pleasant ride across the west side of Vancouver. But it would not do what the new SkyTrain extension promises to do, which is to deliver SkyTrain passengers to the Canada Line near City Hall, and bring commuters by the thousands to Broadway corridor employment centres like the Vancouver General Hospital. Fitch says those commuters could hike the 600 metres up the hill from False Creek. I think not. The City of Vancouver, by the way, has not written off the idea of light rail or a streetcar along the Arbutus Corridor. The future line would ignore UBC and continue far to the south, to Marpole. City planners provided drawings as the basis for a citizen “design jam” in 2017. 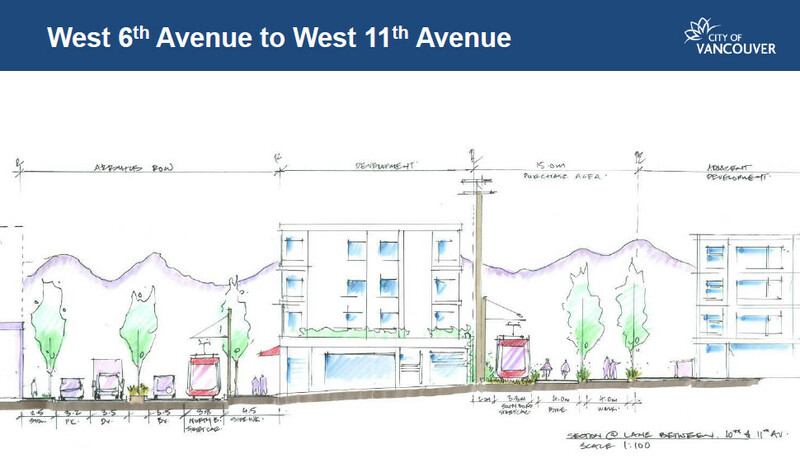 The status of this set of drawings is not clear (to me), and neither is the proposed date for construction. « Funding for Metro Vancouver transit: are we there yet? I would fight against this proposal tooth and nail….right now…not because I would not like to see it but because central Broadway is the much bigger pressing issue (as are several others). Eventually I would like to see LRT on the Arbutus corridor. The Arbutus corridor will eventually be a great transit corridor, there are just so many more pressing routes we need to address first. I am very happy they are planning for LRT on the corridor and leaving the option open for the future. I am also very happy it appears the Millenium line is going to be extended at least as far as Arbutus, this is the best choice by far. I am less concerned about Arbutus to UBC at this point but lets get shovels in the ground to Arbutus as soon as we can. You mention only ‘a few’ skytrain related success stories, but the only limit is the zoning, not the train. Development is exploding at Burquitlam, because it is permitted. I can only imagine how fast developers would pile in at Nanaimo or 29th avenue if they were given half a chance. I support densification in principle, but it’s my opinion that a lot of the SkyTrain related development is oversized — I wrote about this most recently in my post on Brentwood. 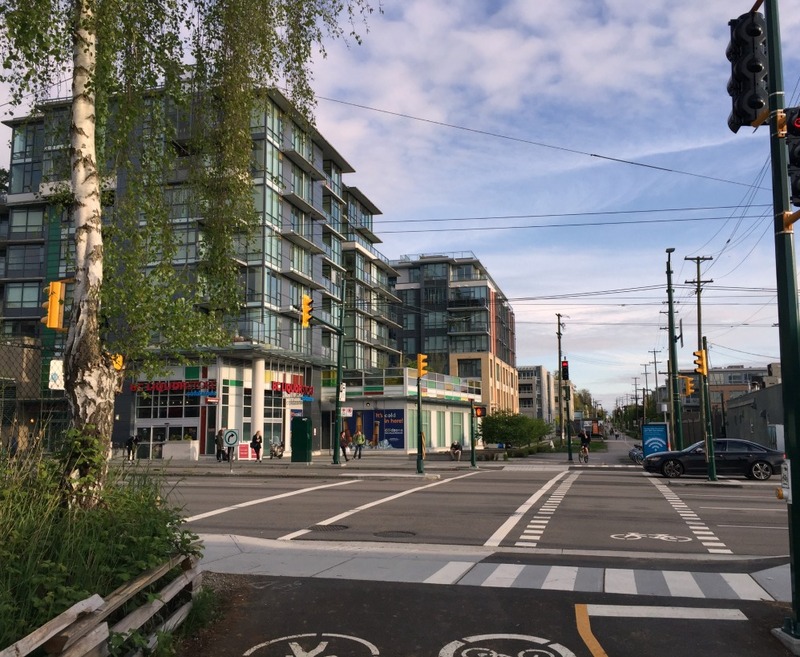 Joyce-Collingwood and Coquitlam Central-Lafarge provide a more livable mixture of high density, medium density and green space, and so are more successful in my view. Metrotown is perhaps the flagship for Skytrain related development, and Burnaby City Council, recently adopted a plan to overhaul that district, basically admitting that the street environment and appearance of the main mall and surrounding streets are not working.